The Managing Director of Nigerian Ports Authority (NPA), Hadiza Bala Usman has reiterated the commitment of the organisation to Safety Standards for all aspects of operations at the nation’s Seaports. She expressed this commitment in her remarks at the opening ceremony of a Capacity Building Workshop on Minimum Safety Standards for trucks doing business in the Ports jointly organized by the Authority and the Federal Roads Safety Corps in Lagos yesterday. Represented by the General Manager, Health, Safety and Environment(HSE), Mr. Ahmed Yusuf, the Managing Director said that NPA will continue to collaborate with all Agencies in the Ports so as to build effective synergy that will ensure all trucks doing business in the Ports comply with the Safety Standards. The Managing Director commended the organizers of the Workshop while urging Participants to put into practice their knowledge from the Workshop. In a welcome address, the Lagos State Sector Commander of the FRSC, Mr. Hyginus Omeje told the Participants that the issue of Minimum Safety Standards was first introduced in the Oil and Gas Sector when the FRSC commenced the implementation of the Road Transport Safety Standards Scheme (RTSSS) which stipulates Minimum Safety Standard for Truck Operators. Mr. Omeje who was represented by the Legal Officer of the Command, Barrister Bonaventure Nnamani lauded the Authority for the partnership and also enjoined Participants to open their minds to Safety Standards. The Federal Roads Safety Corps delivered lectures on Traffic Laws relating to Articulated Vehicles. The Workshop also featured Safe to Load Procedures whilst highlighting the importance of Number Plates and other important accessories concerning Minimum Safety Standards in the Ports. 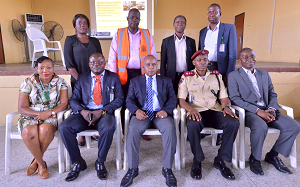 Management of the Authority recently signed a Memorandum of Understanding (MoU) with the Federal Road Safety Commission (FRSC) on the implementation of Minimum Safety Standards for Trucks operating in the Ports. The MoU empowers both NPA and FRSC to raise Joint Inspection and Certification teams to oversee its full implementation.